Another fun and funky area of Austin! 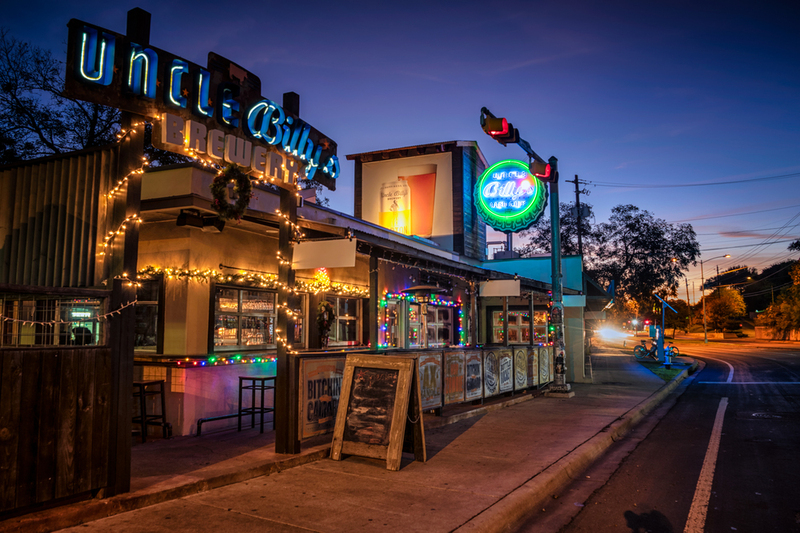 Uncle Billy's Brewery - a place i need to visit during business hours! you can see a glimpse of sunrise in the distance. looking the other way down the street where blue hour is still in full force! I've been out shooting in Austin a LOT lately. Some of this is due to me getting into my new Sony camera system, and thus wanting to try it out in all sorts of different ways. Some of this is due to a photo project I am working on, which I will share in great detail later (hopefully in January, if I can get it finished!). And some of it is just that I love this town and there is a lot to shoot here! Barton Springs Road is a little spot downtown that has a few restaurants on it. Really, it's not a whole lot more than that. It's not a big deal, really, but I love the area. It's just a nice little spot with a few cool things to point the camera at. I love shooting interesting signs and architecture, and have wanted to get down here with a camera for a long time now. I finally did so one recent morning. chuy's is my favorite tex-mex restaurant in austin - so tasty! don't forget to get the creamy jalapeno sauce! fajitas, enchilada and tacos, oh my! So I hopped out of bed, eager to get started and to make sure I was in the right place during blue hour (which I also love, and which is BEFORE sunrise, aarrgghh). At that time of day, I have about a 15 minute drive downtown, which is not much, especially compared to rush hour. Man, that time of day is terrible these days (one of the challenges of the growth that Austin has experienced). It can take an hour to get downtown at rush hour - time you can't get back. Anyways, I made it in plenty of time to fire away happily at the spots you see here today. One of the key reasons I love sunrise so much is that you generally get a place all to yourself, which is what I prefer when shooting cityscapes. They are just better that way, in my opinion. Of course the soft light of blue hour and sunrise is great, too - especially on a chilly winter morning like I had on this day. It was pretty awesome. Plus, you can park ANYWHERE before dawn - everything is wide open. It makes it easy to park, jump out and grab a few shots, hop back in and drive a little more, then do it all over again. Some of these were 5 minute stops for that very reason. Austin java, both restaurant and coffee shop - and a really cool old truck out front! The other thing I did was head over to Barton Springs Pool after grabbing shots of the restaurants and bars that I wanted to get. Barton Springs Pool is a natural spring-fed pool just a very short drive away. It maintains a constant temperature of 68 degrees year-round. It feels great in the summer, considering how hot it gets here. But this is December, and there were still people swimming in it! That's crazy to me, but to each his own. I guess 68 might feel warm considering the air is about 45 or so. Luckily I caught a wonderful sunrise in the distance, and the mist coming off the water was just icing on the cake! This was a shot I have been wanting for years now, literally. I'm glad to have finally gotten it, and with a beautiful sunrise that just makes the wait worthwhile. sunrise at barton springs pool - you see the swimmer out there working hard? I loved the mist in this shot. another view of barton springs pool at sunrise with mist rising into the air! the sign outside the pool - I got excited when the sky started turning pink and ran inside for shots of the pool! philosopher's rock outside of barton springs pool - a nice tribute to friendship and conversation. Well I guess that about sums up the morning I had downtown recently. Hope you enjoyed the photos as much as I enjoyed taking them! Thanks for stopping by today!